Free Shipping Included! 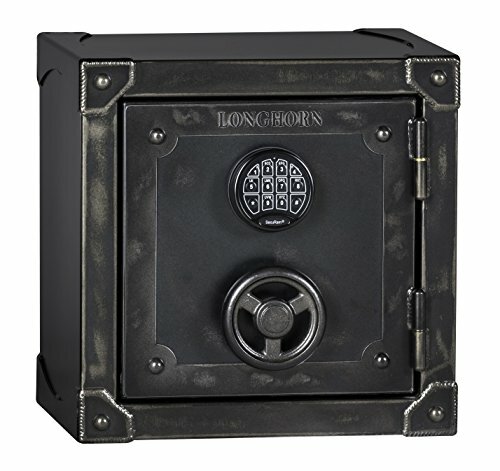 Longhorn Model LSB1818, 90 lbs, Home & Office Gun Safe by Longhorn at Easy Blogging Tip. MPN: LSB1818. Hurry! Limited time offer. Offer valid only while supplies last. Security… Reimagined. Rhino Ironworks Series PSIW1818 personal safe with reinforced construction in a vintage creation, suitable for any setting. Security… Reimagined. Rhino Ironworks Series PSIW1818 personal safe with reinforced construction in a vintage creation, suitable for any setting. Each safe is hand distressed to appear as a well-worn antique, creating a one-of-a-kind furniture piece that is part art and all security. This unique size is suitable for an end table or nightstand so that your valuables are always close-at-hand while the thick plate steel door front, rivet studded reinforcement plates, and anti-drill and anti-punch boltwork defend your valuables against burglars. This series boasts a full coverage 3/16” plate door face and external reinforcement ring for superior security and fire protection. A full 60 minutes of protection at 1400°F. Advanced protection with 2 layers of 5/8" fireboard in the ceiling, 1 layers on the walls, floor, and door. Heat activated door seal expands up to 7 times its size which seals the door edge to help keep out heat and smoke. UL Listed commercial-grade Type 1 electronic lock. Internal Anti-Tamper clutch. Anti-Punch and Anti-Drill Boltworks. Recessed 12 gauge composite door with external reinforcement ring for pry-point protection. Heavy Duty 12 gauge formed steel body with external corner reinforcements on critical attack points. Large door bolts (1.00" diameter), 2-sided protection (4 door bolts total). 90 lbs. External dimensions 18"H x 18"W x 14"D (not including handle). Distressed leatherette interior fabric. Plush adjustable shelving and interior walls. 3-spoke cast iron hand wheel. If you have any questions about this product by Longhorn, contact us by completing and submitting the form below. If you are looking for a specif part number, please include it with your message.